On Saturday, SpaceX is taking its most ambitious step yet toward launching people into space. It’s not sending anyone with a pulse just yet, but this upcoming launch is still a high-consequence event. In the wee hours of the morning on March 2, SpaceX’s shiny new astronaut taxi—dubbed Crew Dragon—will take to the skies, bound for the International Space Station. The flight, officially known as Demo Mission-1 (or DM-1), stars an upgraded version of SpaceX’s Dragon cargo craft. SpaceX has always intended for its Crew Dragon capsules to ferry humans, but every SpaceX Dragon capsule launched so far has only shuttled cargo to and from the ISS. The upgraded version, debuting on DM-1, will feature new crew life-support systems, seats, control panels, and a propulsion system that can be used to keep the crew safe during a launch emergency. 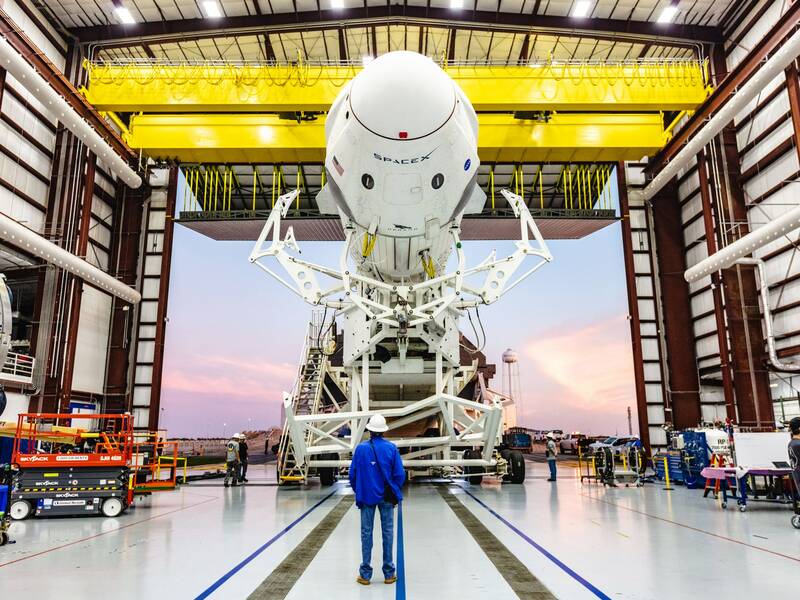 But it won’t carry people; before astronauts can climb aboard, SpaceX has to prove Crew Dragon is ready. That doesn’t mean that the craft will be empty. SpaceX says Dragon will carry supplies for the crew currently on the space station, a radiation experiment, and a mannequin similar to the Starman that flew on board the first Falcon Heavy mission. Perched in one of the craft’s seats, the faux astronaut will be suited up in a custom flight suit that will let SpaceX collect data on the capsule’s environment. Saturday’s mission—which will last approximately five days—is a shortened version of the ones that future crews will complete. That’s because its purpose is to provide critical data about how Crew Dragon performs in space. “Demo-1 is a flight test but also a real mission, a very critical mission,” Bill Gerstenmaier, associate administrator for NASA’s human spaceflight program, said in a news briefing last week. Following a Saturday launch, Crew Dragon is expected to arrive on Sunday morning at the International Space Station, where one of its key tasks will be to show NASA that it can safely dock with the space station—a first for Crew Dragon. To date, all Crew Dragon cargo crafts have berthed it instead: The spacecraft approaches the station and waits for a crew member to grapple it with one of the station’s robotic arms, securing it into place. With this Crew Dragon, the craft’s onboard computers will undertake the riskier maneuver of guiding it in to dock itself. “We need to make sure that it can safely go rendezvous and dock with the space station, and undock safely, and not pose a hazard to the International Space Station,” Kathy Lueders, manager of NASA’s Commercial Crew Dragon Program, said during the same briefing. Following the shuttle program’s end, NASA put its faith in the commercial sector, selecting two companies to build its future space taxis: SpaceX and Boeing. These two companies have worked since 2014 to build a spacecraft capable of carrying crew under a contract worth $6.8 billion. Their vehicles—SpaceX’s Crew Dragon and Boeing’s CST-100 Starliner—will be the agency’s primary means of ferrying astronauts to space. “Human spaceflight is the core mission of SpaceX, so we are really excited to do this. There is nothing more important for us than this endeavor. We really appreciate the opportunity from NASA to really do this and have a chance to fly up to the station,” Hans Koenigsmann, SpaceX’s vice president for build and flight reliability, said in the briefing. If all goes according to plan, sometime this summer a pair of astronauts will fly to the station for a two-week stay. But before that can happen, SpaceX will also conduct a test flight in April. This time it will demonstrate how well the vehicle’s emergency abort system works. Designed to keep the crew safe, this feature is only meant to be used in the event something goes wrong during flight. During the test, eight thrusters—which are embedded in Crew Dragon’s hull—will fire and carry the capsule away from the rocket. (The system is similar to the emergency abort system on the Soyuz rocket, which saved two astronauts during a mishap last October). NASA officials explained in last week’s briefing that Crew Dragon was greenlit for this test flight but is not ready for people just yet. There are still a lot of issues that need to be reviewed before the first crew members can climb aboard—engineers need to make sure the craft’s parachute system performs as expected, and NASA is still analyzing a pesky piece of hardware: COPVs. In order to test the upgrades, NASA says that SpaceX will need to fly seven Falcons with the new COPVs before flying people. To date, SpaceX has flown five of those missions. But if the capsule successfully makes it to orbit and back, SpaceX will be one step closer to its ultimate goal: launching people.